Solar cells based on stacked textile electrodes for integration into fabrics #WearableWednesday « Adafruit Industries – Makers, hackers, artists, designers and engineers! Phys.org has the story on this new type of solar cell that can be integrated into fabric. Your tablet on your jacket sleeve, your smartphone in your watch—conventional batteries are not practicable for ever-lighter wearable electronic devices. A possible alternative is solar cells in the form of a textile that can simple be integrated into clothing. In the journal Angewandte Chemie Chinese researchers have now introduced novel, efficient solar cells based on stable, flexible textile electrodes that can be integrated into fabrics. Various types of threadlike solar cells that can be woven into textiles have previously been produced by twisting two electrically conducting fibers together as electrodes. Practical application of these has been hampered by the fact that it is difficult to make long, efficient, thread-shaped electrodes. The wire-shaped cells are limited to lengths of a few millimeters. It has also been difficult to connect a larger number of crossed wire-shaped solar cells that have been woven into electronic textiles. A team from Fudan University and Tongii University in Shanghai has now developed an alternative approach for the production of flexible solar cells that can be integrated into fabrics. Their method is based on textile electrodes that are stacked into layers. Solar cells need a working electrode that captures light, as well as a counter electrode and an electrolyte. Researchers led by Huisheng Peng produced their working electrode by weaving titanium wires with a diameter of 130 µm into a fabric. They then used an electrochemical process to grow a layer of parallel titanium dioxide nanotubes perpendicular to the wires. In a final step, a special dye was introduced into the titanium dioxide nanotubes. For the counter electrode, the researchers produced layers of highly parallel carbon nanotubes that were then twisted into fine threads with a high degree of mechanical strength, which were in turn woven into a textile. One layer each of working electrode and counter electrode were stacked on top of each other and the double layer was soaked with a liquid electrolyte and sealed or equipped with a solid electrolyte. When the dye molecules are excited by light, they to release electrons into the conducting band of the titanium dioxide. These charges are carried away through the titanium wires and through an attached external circuit to the counter electrode. The electrolyte takes up electrons from the counter electrode by means of a redox reaction, transferring them back to the ionized dye molecules. The stacked textile electrodes also work well when they are bent, which allows the textile solar cells to be easily integrated into knit fabrics or other flexible structures. 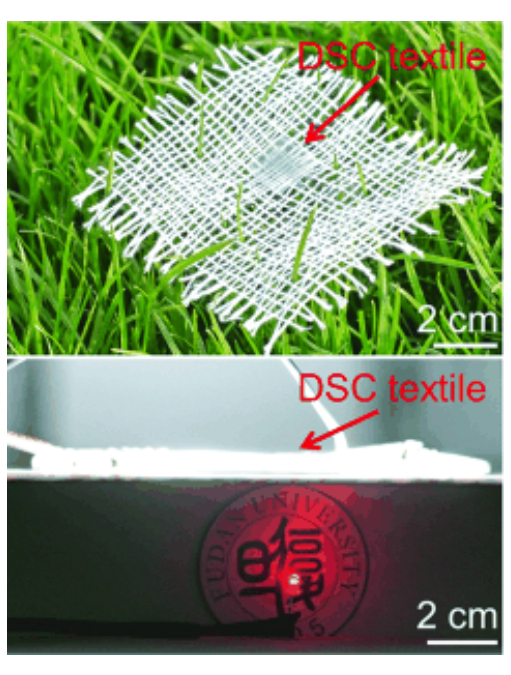 By using several small textile solar cells, the researchers were able to power an LED.